Match Day: Will Med Students’ Dreams Come True? NewsArchive Pages2018 ArchiveMatch Day: Will Med Students’ Dreams Come True? Years of hard work come to fruition Friday, March 16, when medical students at the University of Maryland School of Medicine find out where they’ll spend the next several years of their lives. 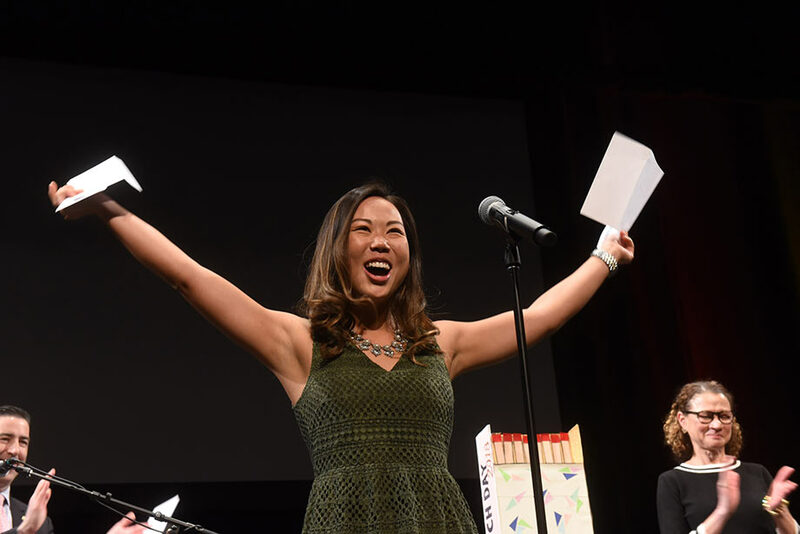 It’s Match Day, when graduating med students across the country find out where they’ll spend their residencies. 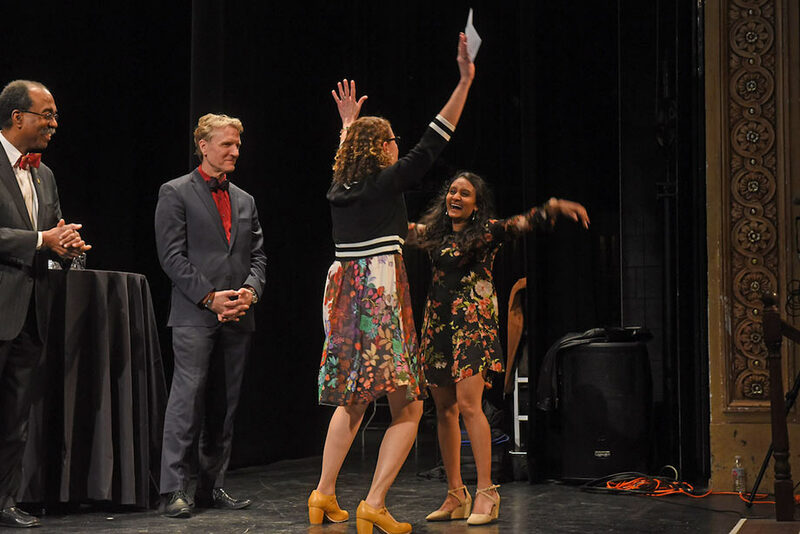 In a gripping, emotional ceremony at the Hippodrome Theater, students in the Class of 2018 will be handed an envelope with the name of their residency. The event is a true-life reality show, because students do not know ahead of time where they are going. This year’s students include Kwabena Yamoah. Born and raised in Ghana, Kwabena came to the US in 2007 when he was 17. He knew he wanted to go into medicine early in life, when he went with his grandfather, a nurse technician, to hospitals in Ghana. All through the early years of his childhood, he and his siblings were raised alone by his mother in Ghana. “I think the struggles from poverty is what inspires me to be successful. Making her happy is what really drove me to do this,” he said. He wants to be a radiologist and hopes to stay in Baltimore because his wife is a neurosurgery resident at Hopkins. 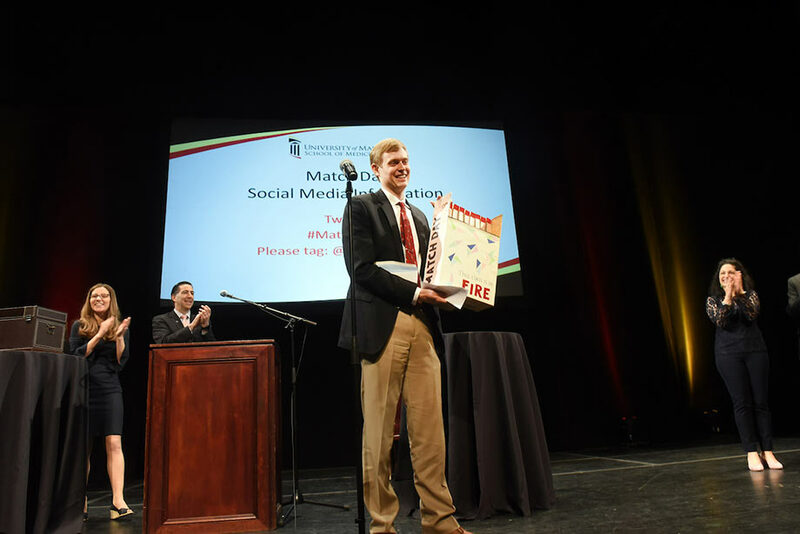 He was extremely happy to find out that he matched to the University of Maryland Medical Center in radiology. Rebka Tekeste moved to the US from Ethiopia when she was 10. She had two children during her time in medical school, the first during her third year and the second just this February. Having her own children has given her important insight into the field of pediatrics. “It’s very easy to know the medicine side of it, but having the first-time experience of being a parent has given me more of a perspective,” she said, noting that it was tough to get through medical school and also become a new parent. “Family is important to me, and I made it work,” she said. 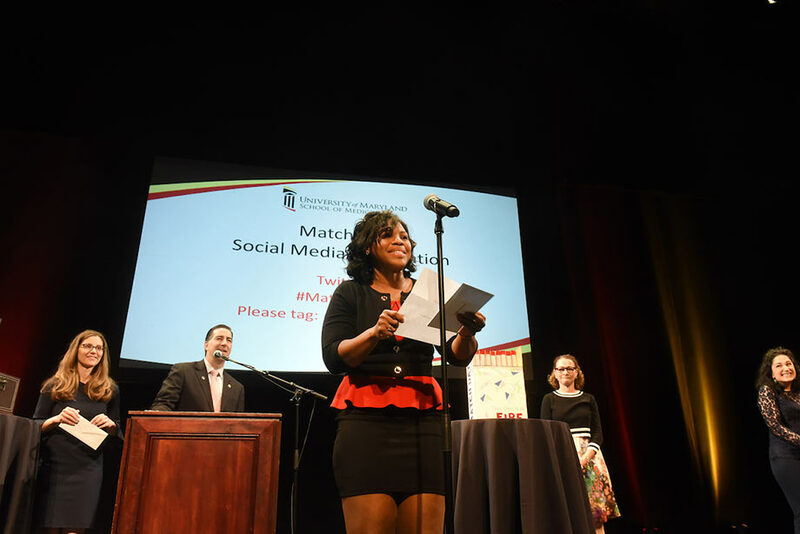 She matched to the University of Maryland Medical Center in pediatrics. Jondavid Landon spent a year after college working on a 36-foot sailboat and sailing from Maine to the Caribbean. After that he became a construction worker and contractor, and only then did he decide to go to medical school. He was matched to Eastern Virginia Medical Center in emergency medicine. Sarah Kaslow took a year off in the middle of medical school to get a public health degree from Johns Hopkins – and have a baby. After getting a degree and giving birth, she returned and finished her MD. She matched with New York University Langone Hospital in general surgery. Zulqarnain (Sono) Khan was born in Pakistan, but his family moved here when he was a small child so that he and his siblings could have better opportunities. He grew up Catonsville and wants to be a cardiologist. 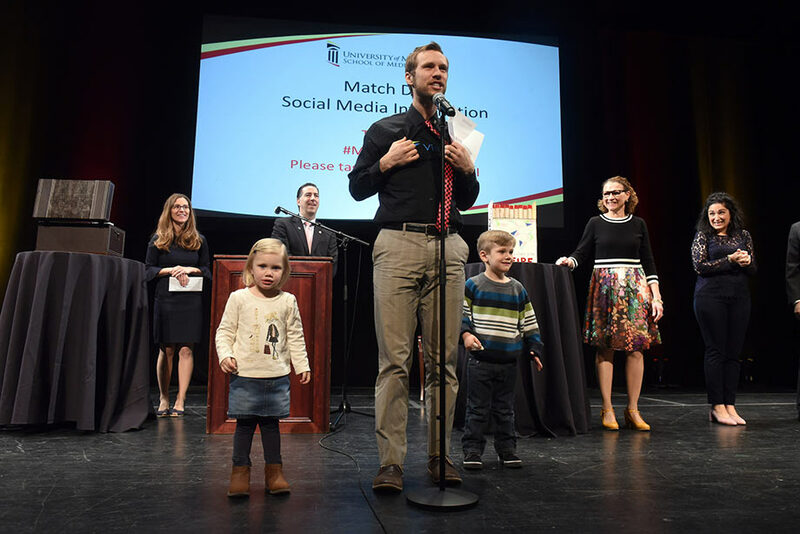 He matched with University of Maryland Medical Center in internal medicine. Danny and Minna Leydorf are a brother and sister from Annapolis, completing medical school at the same time. They are three years apart and were roommates through school. Danny wants to be a surgeon, and Minna wants to be a pediatrician. Minna says having her brother go through medical school with her has been a great experience. “We've both grown immensely, and I believe for the better, through the challenging, but worthwhile, process of medical training thus far,” she said. 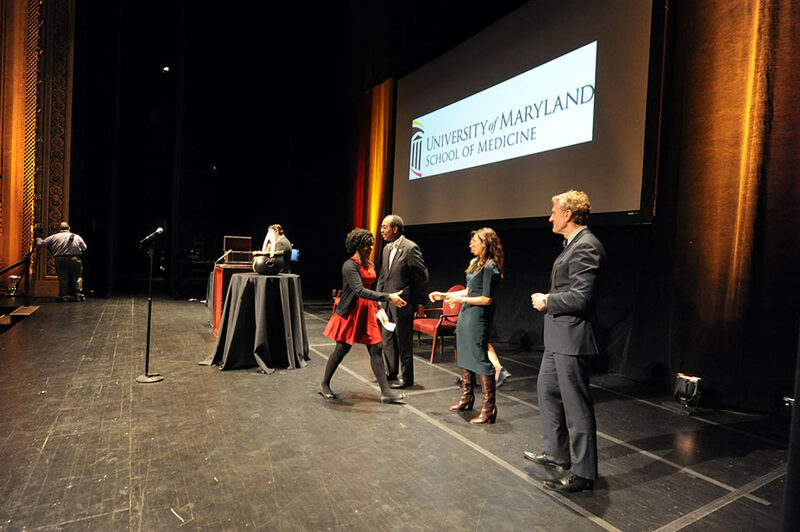 Danny matched at Anne Arundel Medical Center in general surgery, while Minna matched at University of Maryland Medical Center in pediatrics. Stefano Muscatelli played baseball at St. Mary’s College, and wants to be a sports medicine orthopedist. He matched at University of Michigan in orthopedics. Christina Tise is getting a PhD in genetics as well as an MD. She plans to combine research and working with patients, and will focus on pediatrics and genetics. She matched at Stanford University in pediatrics. Joshua Olexa and Gloribel Le are getting married in April. Joshua applied to residency programs in neurosurgery and Gloribel has applied to programs in pediatrics, but mainly they want to be located together. Joshua was driven to neurosurgery after his three back surgeries. He was fascinated with the research but really loves the clinical aspect. “The interaction with people and the desire to help them is was what drove me into medical school,” he said. Realizing that with bench work he would be working less directly with patients. Gloribel has always worked with children and has always had a passion for pediatrics. This began in high school when she volunteered with children with disabilities. 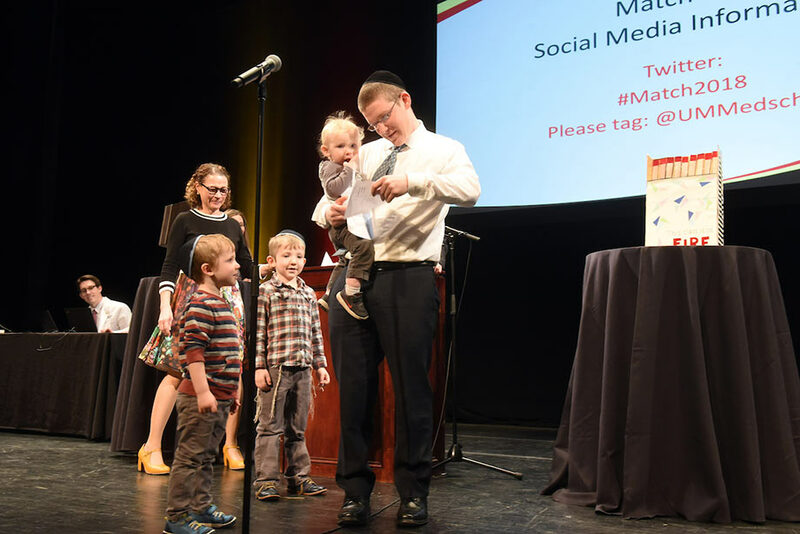 They came up on stage together and were elated to find out that they had both matched at the University of Maryland Medical Center – he in neurosurgery an she in pediatrics. Every student selected their own soundtrack for their walk to the stage. Many students danced their way up, to applause. This year, 142 UM SOM students matched at 69 different hospitals in 30 states. 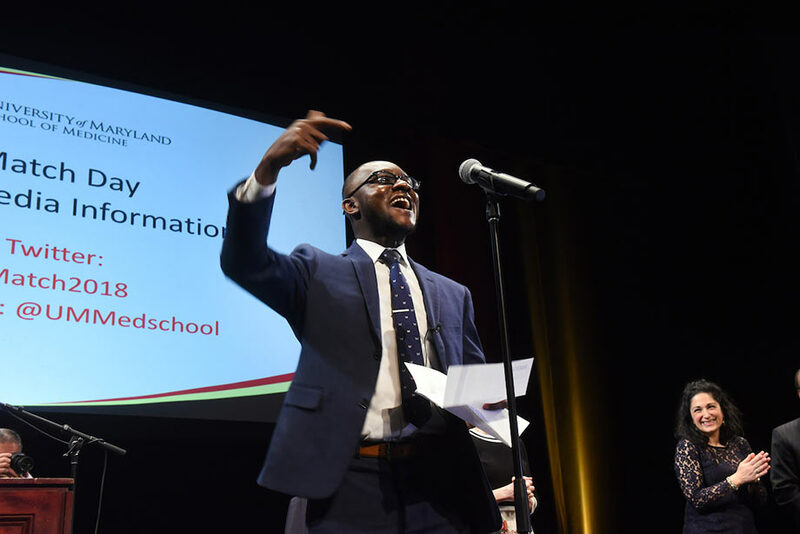 Thirty-nine members of the Class of 2018 will stay in the state of Maryland for their residency training. Nationwide, more than 41,000 U.S. and international students applied for one of the approximately 30,000 first-year residency positions offered in this year’s Main Residency Match, according to the National Residency Matching Program (NRMP). Even though more students than ever are enrolling in medical schools, the United States is still facing a significant physician shortage, according to the Association of American Medical Colleges. 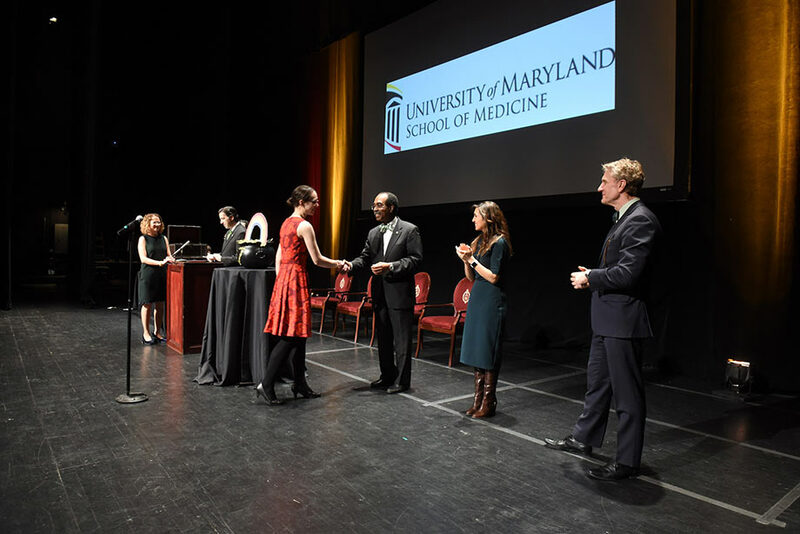 The University of Maryland School of Medicine (UMSOM) held its annual White Coat Ceremony on November 1 at the Hippodrome Theatre in downtown Baltimore. 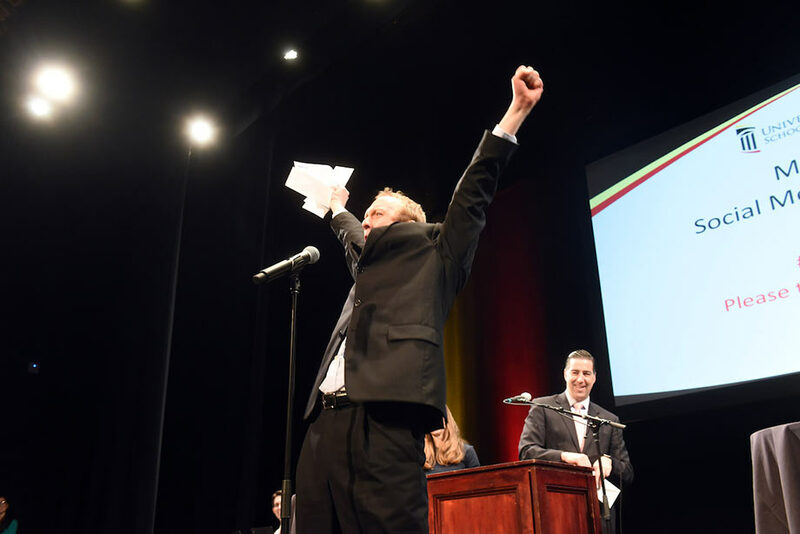 It was a day filled with emotion on at Baltimore’s historic Hippodrome Theater on March 20, when Match Day was held for the Class of 2015 of the University of Maryland School of Medicine.